Commercial wineries sometimes (often?) dilute the grape juice with water before fermentation. This is done (according to that page) because the grapes have too much sugar and can kill off the yeast and malolactic bacteria. I've been told that wineries that do high-end wines don't dilute, but others do. What drove the need for dilution? Is it that the yeasts that are now preferred (or even available) are more fragile? Are we cultivating grapes with more sugar now? Are we now able to engineer more parts of the process that previously fell to chance, and that's somehow involved? Have tastes changed and historically wine was much different in taste or strength? There are several factors at play here. If we think about how grapes were maintained hundreds or thousands of years ago, it was kind of a slapdash affair. In the beginning they probably just grabbed whatever grapes they could off a vine growing up a tree. Later they just haphazardly planted grapes in a field hoping for the best and they mixed everything, Red and white grapes and IF they got a harvest they were grateful. This style of grape growing does not lend itself to high sugar grapes. 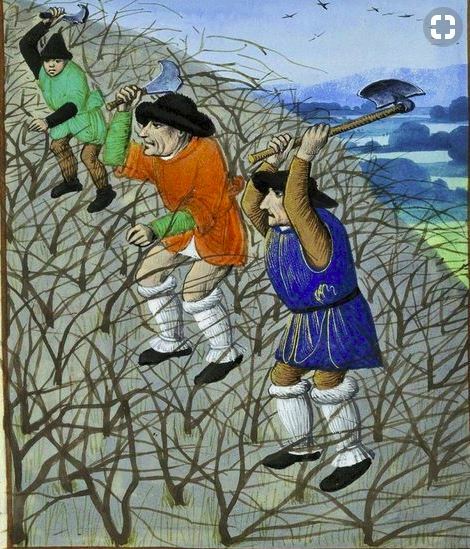 This illustration below shows some middle ages grape growing in Burgundy. It's basically a hillside planted every few inches. No trellis or anything. Several things changed that equation, especially after WW2. New World grape growing. Growing grapes in the new world exploded after WW2 and continues to expand rapidly to this day. Why is this a problem? It is and it isn't. You have to remember grapes like Pinot Noir, Riesling, Cabernet, Grenache were probably grapes that had been domesticated over hundreds or thousands of years to adapt to the climate the original vines were from. Cabernet is a good example. The dreary coast in Bordeaux where the weather is not especially warm. In a good year, the grapes might make a 13% ABV wine. You take Cabernet and stick it in Napa Valley where it is MUCH warmer and sunnier and voila, you have 17% ABV monster cabs. IMHO, it's mostly too hot in Napa Valley to make a balanced wine. Same with much of Australia and South America. Modern Viticultural practices. Also after WW2 irrigation was introduced this enabled growers to grow wine in areas that were too dry to grow grapes without it. Washington State is a good example. The Yakima valley gets around 9 inches of rain a year, but the temperatures are within a range of growing grapes, if a little too hot and sunny. Now you have a region that looks nothing like where the grapes originally came from. This also pertains to just about everything about growing grapes today. Trellis systems, fungicides, rootstocks, soil management, canopy management. Everything is done with a high precision to eke out the most of the vines, resulting in wines that are super ripe. Modern Tastes - As our palates seek out more and more sweet things, many of these modern wines are made with higher alcohols on purpose because many times high octane wines come with a fair amount of residual sugar. Because we can! In the new world we don't have the baggage that they do in Europe. We are allowed to pretty much do anything to our wines as long as it's legal and food grade. So, if you grapes accidentally got a few extra days in 100+ degree weather and started to turn to raisins and they are at 29 brix. You paid good money for those grapes and you can't waste them so you dump some acidulated water into your fermenter to water them down to acceptable levels and replace some acid that was lost because your grapes are over ripe. All perfectly legal in the New World, but absolutely verbotten in Europe. Brand name grapes - Everyone wants Cabernet and Chardonnay. Sure you can grow them in the Central Valley in California where it is super hot in the summer, but what type of wine do you get? Hardly recognizable from the original areas they came from, but the consumers just want to have these brand name grapes so we plant them in places of abundant heat having to water them down in the fermenter to make acceptable wines. I remember my viticulture teacher telling me that you should plant grapes that would ripen almost at the last possible day of the season. This would result in grapes that are in harmony with the local climate. What you see in many places like California where grapes are harvested in July and August and there is still MONTHS of hot weather ahead. All of this leads to a situation where many of the grapes we plant in the new world are simply not in the best climate for the best wine. 99% of the time it's grapes planted in a climate that's simply too hot. That's why we water our wines down. Not the answer you're looking for? Browse other questions tagged history wine production or ask your own question.